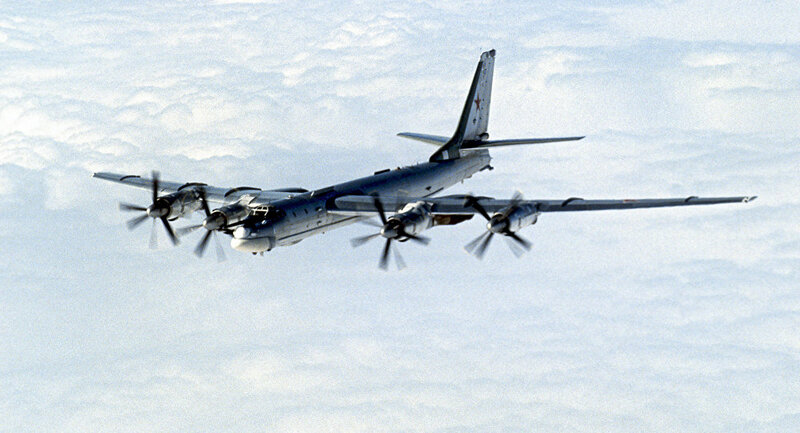 Russian military analyst Vladimir Tuchkov explains why the Russian Defense Ministry continues to order new Tupolev Tu-95 turboprop-powered strategic bombers, which entered into service in the Soviet (and then Russian) air forces over 60 years ago. Last week, Tupolev Joint Stock Company director general Alexander Konyukhov told Russian media that the Defense Ministry will soon receive seven Tu-95MS strategic cruise missile carriers for the country’s Aerospace Defense Forces. The delivery will add to a Tu-95MS plane delivered to the military in April. “As for the 57 Tu-95MS-16, that plane has four nodes on its external suspension equipped with missile and bomb weapons. In addition, in place of the two AM-23 aircraft cannons, these planes have two double-barreled GS-23L 23 mm cannons, along with improved cabin ergonomics.”The Tu-95MS-16 is capable of carrying 16 Kh-55 cruise missiles of various modifications, including a nuclear-armed missile with a 200 kiloton yield, and a strike range of between 2,000-3,500 km. The missile carrier version received new instrumentation in the 1980s, as well as a new engine – the NK-12MP, created at the Samara-based Kuznetsov Design Bureau. That engine design is an upgraded version of the NK-12MV used by the Tu-95, featuring higher reliability and ease of maintenance.